A few weeks ago I bought an Esterbrook Dollar Pen that was in fairly decent condition even though it didn't work. The barrel, section, lever, and feed were in good shape but the nib was used to spear cheese cubes or something. It was crumpled and not repairable, so a new nib was in order. To add insult to injury, I put some gouges in the section when my re-worked pliers slipped, including a very noticeable nick at the lip of the barrel. Over at Fountain Pen Network I met 777, who repairs Esties. He's restored the pen, including working out most of the scratch marks and gouges, and sent me these pics. I can't wait to actually see it and give it a try (before it goes on to someone else), the blue is really beautiful. Another OXO pen I found at Staples, also on sale, was this Good Grip ballpoint. I love the black matte hard rubber design, it's a substantial pen with a short refill that has a very nice 1.0mm tip. The line didn't seem too wide, in fact I thought it was a 0.5mm or 0.7mm until I took the pen apart. Twist the pen and two things happen: the tip descends so you can write and the pen clip disappears. The pen cannot be clipped to your pocket while the refill is engaged, so there's no chance for an oil-based ink disaster (and no need for a pocket protector, unless that's your look). The pen is hefty, no slim Hi-Tec-C here, and easy to grip (the whole point of OXO). I like the overall design and hand-feel of this pen, if you're looking for some additions to your line-up you might want to give these a try. When it comes to products that make life easier, OXO is the brand to look for in the housewares and supplies aisles. The distinctive black rubber design is easy to hold and doesn't cramp the hand, and the wide array of tools and accessories are easily identifiable among the myriad brands. A few years back, when OXO was leaving their old location in NYC they held a moving sale that was standing room only (I picked up quite a few bowls and other kitchenwares). The OXO line for Staples is as nicely designed as their housewares and garden tools, and many of their office supplies are on sale so that was an added incentive to pick up some pens. As I'm out of markers, I grabbed a set of retractable permanent markers in assorted colors to test out. The marker is large, with an all-black design I like (the red trim is a piece of tape that can be removed). Twisting the pen pushes down the marker, which has a broad, bullet-shaped tip. The rubber barrel makes for a comfortable grip, while the matte/shiny black contrast is a nice touch. Writing is easy, but like a Sharpie there is bleed through on writing paper. It's a great looking marker that I'll enjoy using it for various projects and quick notes. Back in Pennsylvania last weekend, a friend and I were wandering through a farmer's market when I came across this old kiddie ride. It's battered and scratched but still working, although the sign on it noting the 50 pound weight limit says something about modern life. I remember this from my own childhood, and while I don't think I ever rode on this when I was a kiddie I do remember the horses and cars and stuff we used to play on outside various markets and stores. 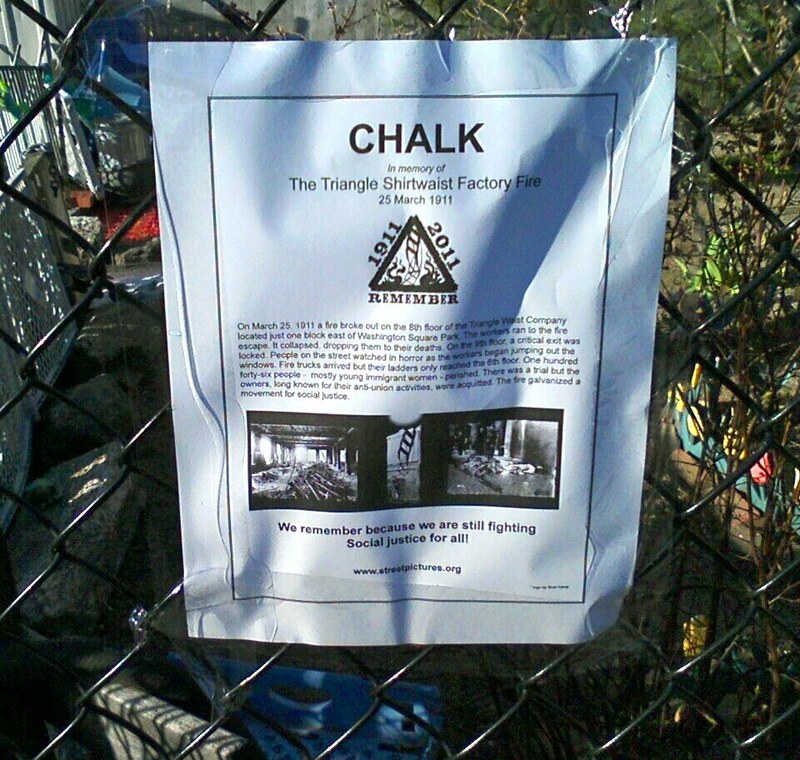 Friday, March 25 marked the 100th anniversary of the Triangle Waist Factory fire, where 146 people (almost entirely women) were killed when a fire broke out at the Triangle factory. The women made shirtwaists, a blouse that tucked into the long skirts of the time, giving a more defined look that matched the new style in tailored-looking shorter skirts (they ended just above the ankle, quite daring at the time). The women in the factory were locked into their 9th floor work are by owner, to discourage theft. Surrounded by yards of cotton fabrics, combustible dust, and open buckets of oil used to grease the machinery, when the spark ignited it took only a few moments to build into an inferno. One point worth noting: when unions were formed for better wages and work conditions (not an easy task in itself), they were men's unions. Women had to form their own unions, and they were understandably angry that men didn't see them as a part of the struggle for safe working conditions and decent wages. 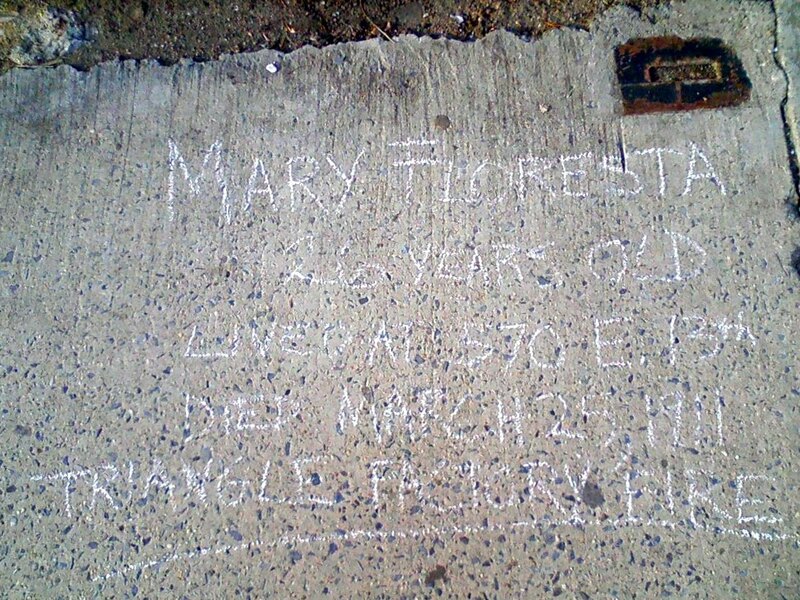 My grandmother was a member of the International Ladies Garment Workers Union, founded to advance the cause of women garment workers such as those who jumped out of the windows of the Triangle Factory on March 25, 1911. OfficeSupplyGeek is running a giveaway, enter to win a Giant Paper Clip Wall Hook. Ink Nouveau shows off the Pilot Iroshizuku inks and pens available at Goulet Pens. I like Rotring, especially their fountain pens, so here's a very thorough review of the Rotring Rapid Pro Mechanical Pencil at Dave's Mechanical Pencils. In case you missed National Puppy Day, The Finer Things has a round up of cute canine gifts. 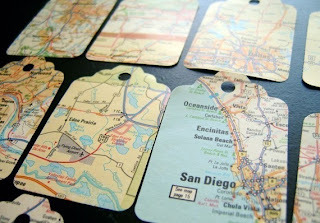 Pantone Chip Magnets at How About Orange, a really great DIY project. 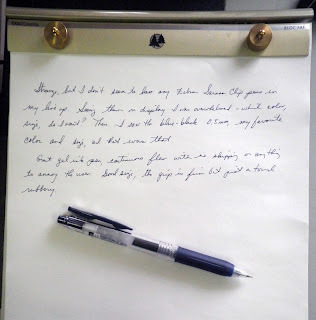 Tom at Goldspot Pens Blog asks: an iPad 2 or a fountain pen? Tiger Pens Blog highlights the Vat19.com's inkless metal pen. Franklin-Christoph has a great StockRoom on their website where they showcase samples, demos, and select private collection pens for sale. Not everything is ultra-expensive, and the stock does rotate quite fast, thus I find it both fun and dangerous to stop by and check out the latest offerings. One that caught my eye is this Model 27 fountain pen with a fine nib. It's black and chrome design is understated, but the chrome cap is one of the heaviest I've ever had and makes posting noticeably top heavy. Besides that, the pen is a dream to write with as the nib just seems to love the Rhodia paper and glided without a skip or drag. The pen can take cartridges or a converter, which comes with it. One interesting part of the pen was the blind cap, which you don't see much on modern fountain pens. This makes the M27 into a pseudo-vacuum filler, twisting the end of the converter to draw up ink. As I prefer to see my converter fill, I tend to just take the barrel off the section. 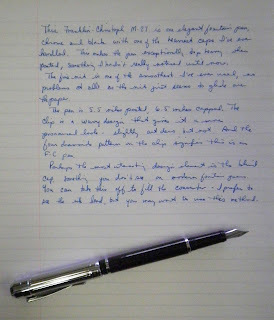 But you don't have to with the M27, which makes it an even more intriguing pen. Whether buying from the Stockroom or the regular sales area, the pen comes with a lifetime guaranty. Shipping is quite fast, and they respond quickly to emails and tweets. It's a great pen store to browse and buy, definitely take a look sometime. At the recent Long Island Pen Show I picked up some Field Notes Steno Books. Slightly bigger than a regular stenography notebook at 6" x 9", Field Notes has really given this classic notepad a stylish upgrade. The rounded edges mimic the traditional pocket-sized Field Notes notebooks, while the cover is a very sturdy chipboard in a deeper brown. The ink is Dictation Smudge, if anyone is interested. Inside, the paper is ruled in the traditional steno notebook manner, with one horizontal line in the middle. I like that the color of the lines is the same as in the Field Notes notebooks: soy-based Double Knee Duck Canvas light brown ink. As I understand it, the Gregg system of stenography, which became the standard taught in almost all US public schools by the early 1900s, had a line in the middle because when taking dictation it was easier to lift your pencil from the middle of the line than from the end. So shorthand used two columns, rather than the entire page. As always, Field Notes provides a back cover dedicated to the relevant minutiae: A Brief History of Stenography, Steno Book specs, and an Abbreviations Guide that is illuminating (MBCC: Migratory Bird Conservation commission; SWLC: Salt Water Leak Check; DLP: Dairy, Livestock and Poultry Division). The paper is Finch Paper Opaque Smooth 70# "Bright White" which really doesn't seem that bright. It's great for gel ink and oil based ink, not so good with fountain pens (a touch of bleedthrough), and obviously works well with a pencil. I like the old-fashionedness of this notepad and the quality of the design. Definitely consider adding one of these in your next order. The Annex on 25th Street between 6th & 7th Avenues has about 75 dealers or more crammed into the ground and 2nd floors of a parking garage that is closed on weekends. This particular flea market has lots of vintage watches, costume jewelry, furniture, stamps, clothing--but I've never seen any pens. The total came out to $90, or $22.50 a pen--decent but not a steal. But the vendors have to pay rent too, so I'm not going to complain. I have pens that I want in my collection, although none of these work and they'll be going off to various people for general repairs and more specialized work (the clip on the 3V has had it, that's not brass it's rust and re-plating will be necessary). I'm hoping in the next few months, at the most by September, that I'll have them all restored and writing up a storm. For now, I just enjoy looking at them and feeling lucky that I even found them at the Annex. There were a few more I looked at but wasn't sure about, so perhaps next weekend I'll head back. This was something I couldn't resist: a Maruman Mnemosyne Project Holder padfolio with a 188 notepad, something I've not seen anywhere but Kinokuniya (of course). They had exactly one in stock, along with one of the larger Project Holders that I decided to bypass (for now, if not for good). The 188 is my favorite size at 5.8 by 8.3, similar to the wonderful Rhodia Bloc No. 16 notepad. The Project Holder is made of study yet very flexible black vinyl/plastic, and the outside carries the gold Mnemosyne embossed logo. Inside it has a side pocket and also a slit for business cards or post-its or whatnot. The notepad is on the right, and fits snugly into the top slit. Other notepads will also fit into this, which is great as I'm not sure I always want a Mnemosyne gridded pad to write on. It's sleek and elegant, a great way to carry your Mnemosyne notepad. It's a bit pricey at JetPens, which in itself interesting: usually Kinokuniya's items are higher than JetPens, as the former has a very large bricks and mortar store on 40th Street and 6th Avenue so overhead adds a lot to the cost. But this 188 Project Holder was almost $10 less at Kinokuniya than at JetPens. Not sure why that would be, but it could be a matter of a simple "oops--wrong number." If you are thinking of purchasing a distinctive-looking padfolio, the Maruman Mnemosyne Project Holder in either size (medium or larger) is something to consider. Trying out some pens in the stationery aisle I smelled something sweet and looked around for the source, then realized it was the pen I was holding. Zebra Lafleche Sweet Scents Gel Ink Pens smell and taste sweet, and come in 6 flavors: strawberry, blueberry, chocolate, lemon mousse, green tea, and chestnut. Trying out the blueberry and chestnut on a Mnemosyne notepad, I found the ink flowed well with no skipping. The 0.7mm tip seems wider, and I liked the dark blueberry and chestnut brown colors. I don't know how long the scent and taste last, but long enough to be noticeable in my bookbag. Finally, the pen design is quite interesting. The barrel of the pen is round, but the cap is square so it won't roll off onto the floor. I liked that a lot, and hope Zebra incorporates this design into a few more pens that aren't quite as noticeable. Wandering through one of the area flea markets, I finally came upon a seller with some pens wrapped up in plastic bags. I saw this Pilot and thought it looked familiar, so I bought it for a few dollars and went home to check it out. The pen is actually a Pilot Custom 74 pencil, with a plunger system that pushes the lead out of the steel cartridge. The rubber eraser was used a bit and the end was crumbling inside the steel cartridge, but other than that everything works perfectly. 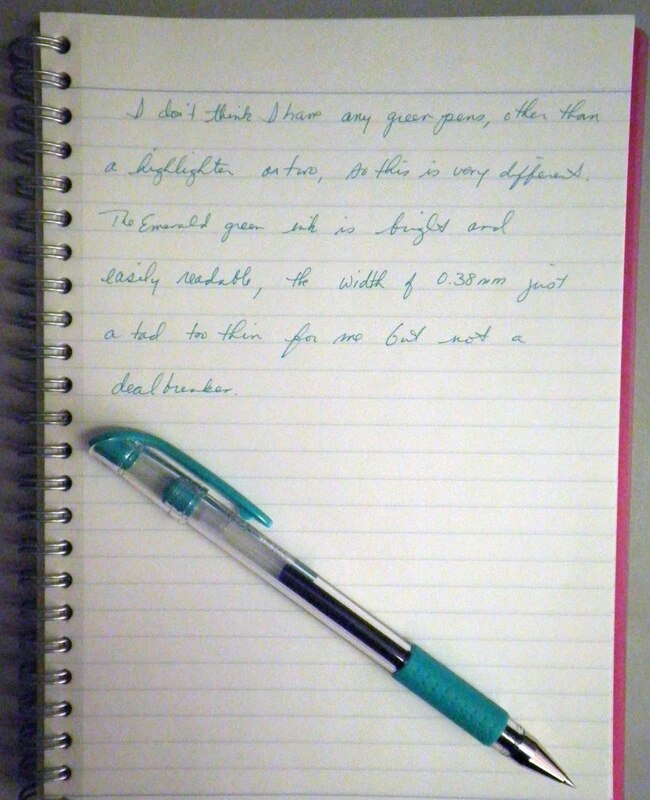 The pencil uses 0.5mm lead, which seemed small until I started writing with it. There are no nicks or scratches on the barrel or cap, no brassing or wear at all, just some minor micro-scratching on the section. It's a great find, and a nice addition to my collection as I already own a Custom 74 fountain pen. The main pen section at Kinokuniya, gel and oil ink pens with the Zebra Sarasa clip pens on the left. 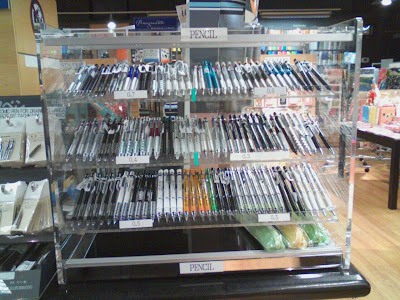 The mechanical pencil display, which always makes me stop and look. Thinking about the people who work there, I hope their friends and family in Japan are safe and well. A little late, but I just realized I hadn't checked in on the March 2011 Carnival of Pen, Pencil and Paper hosted this month by travisthetrout of Notes in a Book. 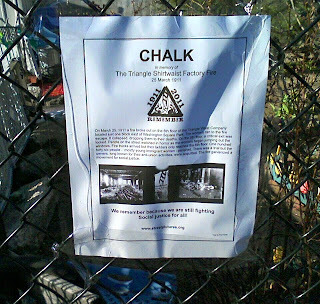 Many great links, stop by and take a look. I have different Zebra Sarasa gel ink pens in use, but didn't see the Clip until a few days ago in a stationery store looking for something different. Once I tried it I was very taken by it, particularly with the clip design which is rounded and substantial and has a definite mechanism that pushes down to open. Not a thin rectangle of hard plastic, which I tend to break sliding a fingernail under it to pull it open. Or else idly playing with it until it breaks off, something I do too often with my pens. This clip looks like it's rugged enough for even my destructive tendencies. What really caught my attention was the enormous choice of colors, including my all-time favorite blue black ink. The Sarasa's gel ink flows smoothly and cleanly, and the 0.5mm tip is just the width I like when writing with a non-fountain pen. These elements and the detailing on the clip (which for some reason reminds me of a school emblem) makes this an attractive pen as well as a practical one. One step closer to having my three fix dinner for me. These are cute and clever, a way to recycle a paper map that's decorative and useful. Update: reposted as there doesn't seem to be a problem with international entries. Notemaker is having a contest with the theme "Think Offline" and a grand prize of a year's worth of Rhodia goodies. Every entry (and I mailed mine already!) will receive a prize. 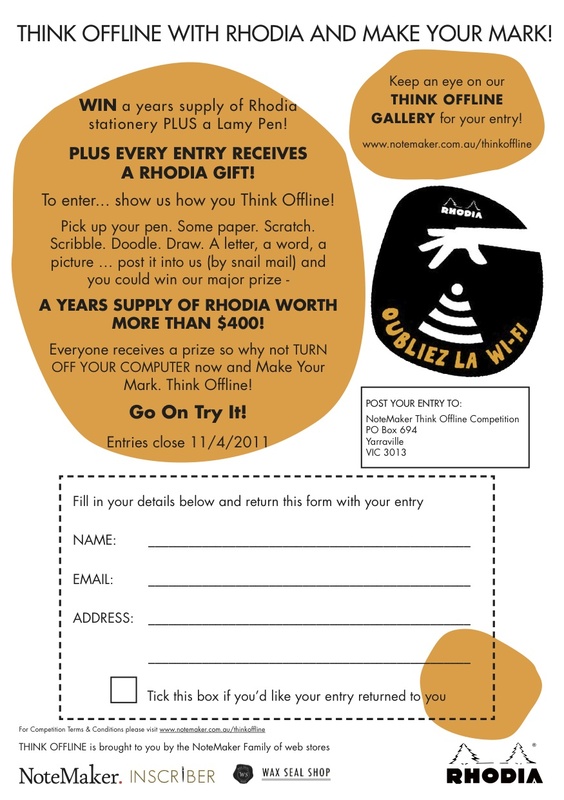 Take a look and send an entry. Just keep in mind that if you're mailing from the US, this is going to Australia so you can't use the "Forever" stamp (international mail requires an amount be shown on the stamp, and the Forever stamps have no value marked on them). Need to write a quick note but can't find paper or a yellow sticky? This should help: a Post-It Laptop Note Dispenser, available at Staples and Office Max and likely your local office supply shop. The three-pack of dispensers (black, pink, green) comes with the accordion-style Post-It Notes that fit inside. The back of the dispenser is coated with a super-sticky adhesive that can be removed and re-applied with no loss of "stickability" and no tacky substance on your laptop. The design is actually quite simple, something akin to making an envelope with a slit. DIYers will have to come up with an adhesive that doesn't leave marks and remains suitably fresh for re-use, but I imagine there is some compound out there. The best alternative might be to just buy a few packs of these, since they work on refrigerators and other surfaces where you are most likely to need to make a note but don't have a pad handy. My only thought as I attached this to my MacBook was that I'll need to write a note reminding myself it's there! The one not pictured is the Sheaffer Balance with a #5 nib I bought from Robin Zorn that's on its way to my brother. I was so busy wandering around, then guarding my place in line for Richard Binder (#11), that I didn't get as many pictures as I would have liked. There was a dealer there (to the far left but not shown in this picture), set up on the blue tablecloth, with hand-made pens that reminded me of Edison Pen Co.'s Hudson--and some of them were clear demonstrators that were beautiful. One of the dealers I purchased from (in the chair), Ron, who had an Esterbrook copper icicle in pretty good condition that's now in my collection. He also had some beautiful vintage and modern Sheaffers that I was keenly interested in but couldn't really rationalize. So we troop in at 10 am and everyone heads for the sign up sheet with Richard Binder (above) and Ron Zorn. I log in at #11 for Binder. At 11:30 I double back to see where things are, and see that I'm second in line after the guy on the right gets into the chair. Barbara thinks it will be about 30 minutes, so I go wander around. What she didn't know is that the guy in the chair was buying a nib so Richard worked over the the other pens the guy had with him--5 or 6, actually. Then two guys on the sheet ahead of me decided they didn't want to go when they were called, and then came back on line right in front of me. I was finally invited to take a seat around 1 pm. As I'm sitting there learning that I'm putting too much pressure on the nib and that's why it feels scratchy, two guys right behind me start raising their voices a bit and making lots of noise. They had agreed to switch places so one guy could go look at more pens, but after wandering around he then changed his mind and wanted his old place in line back. The guy who had gone from #18 to #12 and was right after me said no. I paid my bill, grabbed my pens, and ran. This was all over sitting in Richard Binder's guest chair, by the way. One of the tables of dealers at the show. 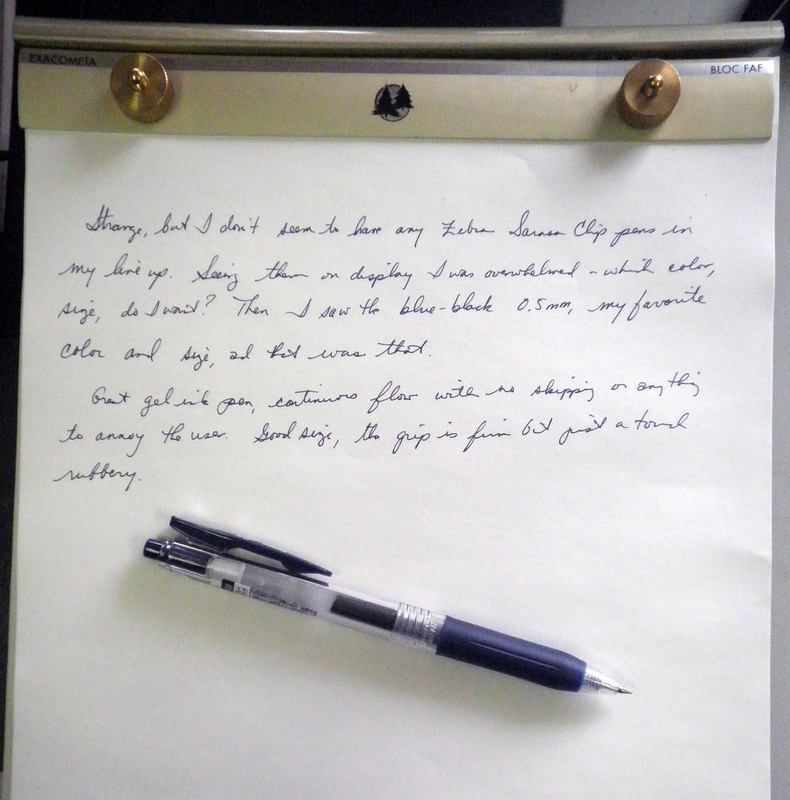 I bought several pens, including a Parker Vacumatic azure debutante in excellent condition. I've used Uni-ball Signos in the past and liked them, favoring the 0.5mm tip more than any other. But when I saw this Signo at Kinokuniya I had to pick one up even though it's a 0.38mm tip, because of the distinctive emerald green color of the pen and the ink. The color, which is found on the cap and plastic end "jewel" as well as the rubber grip, is beautiful. I have very few green pens, and only one fountain pen ink in green, and they are more in the grass-leaf-pine tree category of a darker, truer green. This emerald green has just a touch more yellow to it, giving it a refreshingly bright tone. 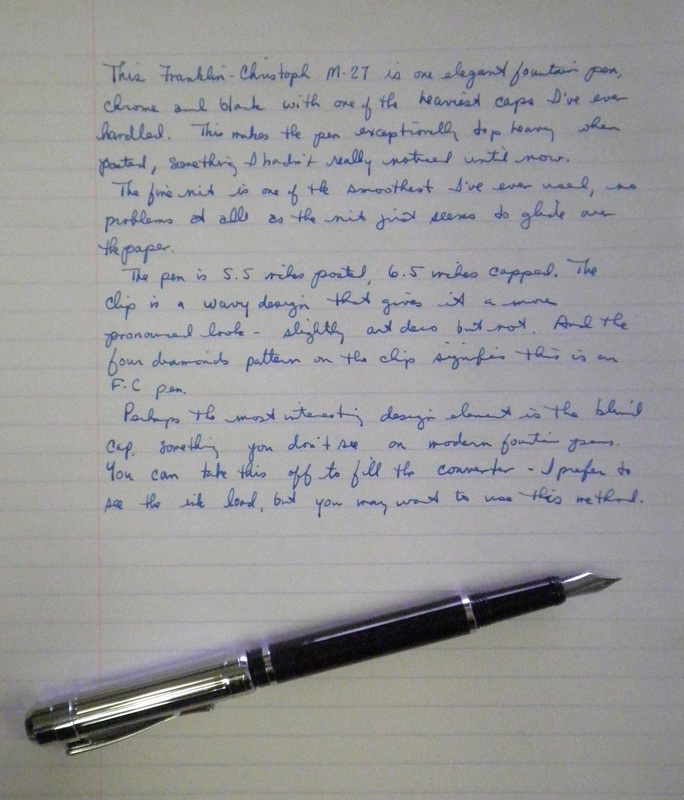 As with the rest of the Signo line, this pen is a joy to write with as the ink doesn't skip or smear. The line is a tad thinner than I would like, but if I want the color I'll have to take what I can get. Interestingly, JetPens only stocks this color in the 0.28mm size. But if you like bright green ink and a thinner line, you'll definitely want to try one of these. 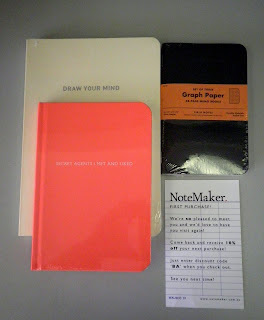 My first order from Australian retailer Notemaker just arrived, thought I'd post a pic of the journals. You can also follow them on Twitter @NoteMakerTweets. Top right is the limited edition Raven's Wing from Field Notes; bottom left is an Archie Grand "Secret Agents I Met and Liked" blank notebook (120 pages, 4.5x6.5); and finally, top left is an MMMG ivory "Draw Your Mind" blank notbook (96 pages, 5.75x8.25). At the bottom right is the card they sent with it, which looks very much like the cards libraries used to keep track of due dates. FYI, shipping from Oz to US is $30. But it was worth it (and I had a slight overage in the budget this month that wanted a Southern Cross trip). In the lobby at 7 W. 34th Street, which was packed with people 30 minutes before the 11:00 am opening. First stop on the way into the space was Tavalon Tea, which looked inviting. The tea and its presentation is top notch, just one little problem for me--many of the teas contain sunflower, which I found to be on the bitter side and didn't like. I really tried to like several of their blends, but that sunflower got in the way. Harney & Sons tea company, where I sampled several teas and chose the Orange and Raspberry teas, partly because I liked the flavor and partly because I loved the tins they came in. The lady in white is Kim of Tea Classics/Hancha Tea. She spent an insane amount of time helping me find the right tea, which turned out to be a Cassia tisane. It's a combination of strong and bold, which I was looking for in a hot drink. I've actually seen this in several cafes, now that I've become more interested in tea and recognize names. Finally, this had to be my favorite table of the whole show: Red Bee Honey. A pure, artisinal honey, they offered about a dozen different (and delicious) honey flavors, including orange blossom, apple blossom, raspberry, sweet gallberry, clover, and many more. Seeing the honey in wine glasses was a lot of fun, we could smell them and compare their colors without messing up fingers. I came home with three bottles, and Red Bee will be one definite reason to attend again next year. A few weeks ago, while roaming the pen section at Kinokuniya, I saw these Uni-ball Laknocks in an assortment of bright colors and decided to try this blue one. 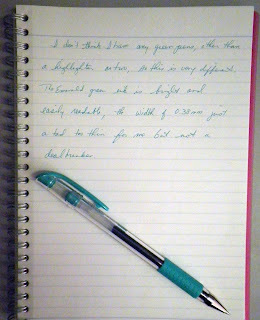 The pictures don't really capture the sky-blue color of the pen, although the above is pretty close. This Laknock is a 0.7mm ballpoint, and has a finer line than you would expect for that width due to the oil-based ink. No skipping, smudging, blobbing that I could see, but really it was all about the color. So imagine my surprise when I tried to find it at JetPens, only to see that they only stock the 1.4mm black, blue, and red standard Laknock ballpoints. No bright colors in smaller widths. 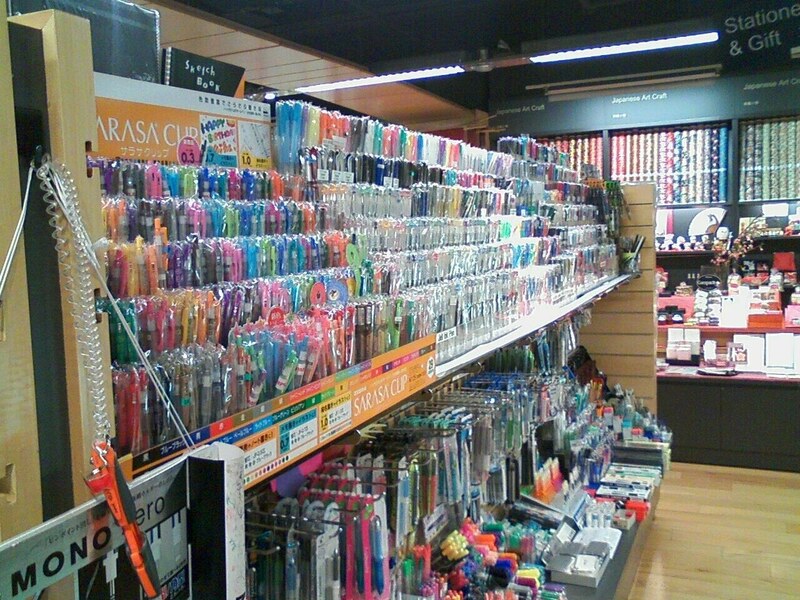 Tokyo Pen Shop doesn't carry the Laknock at all, though their selection of pastel Jetstream pens makes up for that. 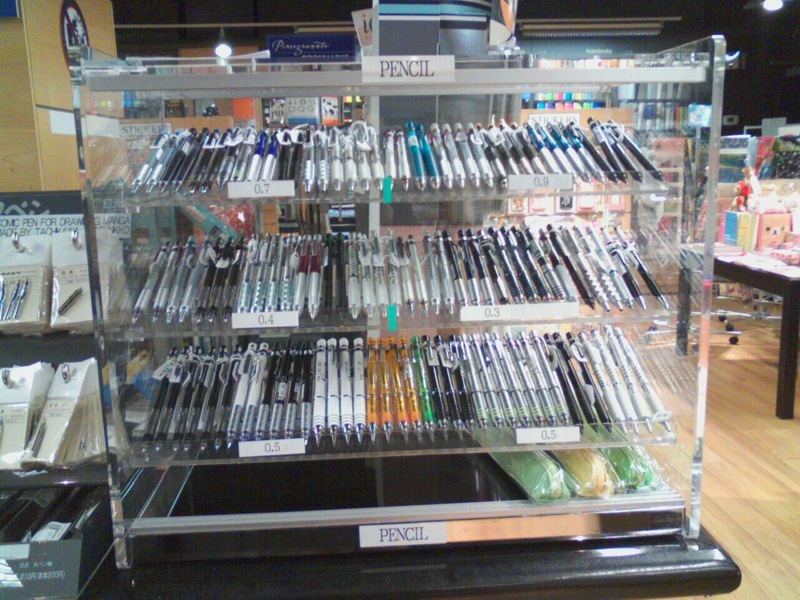 So I may have to head back to Kinokuniya and try to get a picture of that display case as well as a few more of these pens. I like the colors, and the line width the 0.7mm gives me.